This is the first of our overview series of the main hotel loyalty schemes. Each scheme will be covered over two posts on consecutive days. One will list the basic facts of the scheme – basically ‘How does Hilton Honors work?‘ – the other will be my subjective view of what is of particular merit. Hilton Honors covers 5,200 hotels globally under 14 brands – Waldorf Astoria, Conrad, Hilton, Hilton Grand Vacation, Embassy Suites, DoubleTree, Hilton Garden Inn, Homewood Suites, Hampton Inn, Canopy, Curio, Tru, Tapestry Collection and Home2Suites brands. The Hilton Honors website is here. What is the geographic spread? The European properties are mainly branded Hilton with a growing number of DoubleTree, Hampton and Waldorf Astoria sites. In general, many UK Hilton branded hotels in the regions are tired and in need of refurbishment although newer openings (Bankside, St George’s Park, Manchester, Bournemouth) are impressive. DoubleTree, especially the ex-Mint brand hotels in London, is well regarded despite technically being one rung below the main Hilton brand. After a few years of stagnation, there have been a number of high-profile hotel openings recently – Hampton (a budget brand with free breakfast and free internet) is seen as having most potential and they are now popping up across the UK. Do I use them? I do. I currently have Hilton Honors Diamond status until March 2019 following the ‘stay eight times in 90 days’ challenge. I reviewed paid stays at the impressive Conrad Tokyo and Waldorf-Astoria Beijing last year. 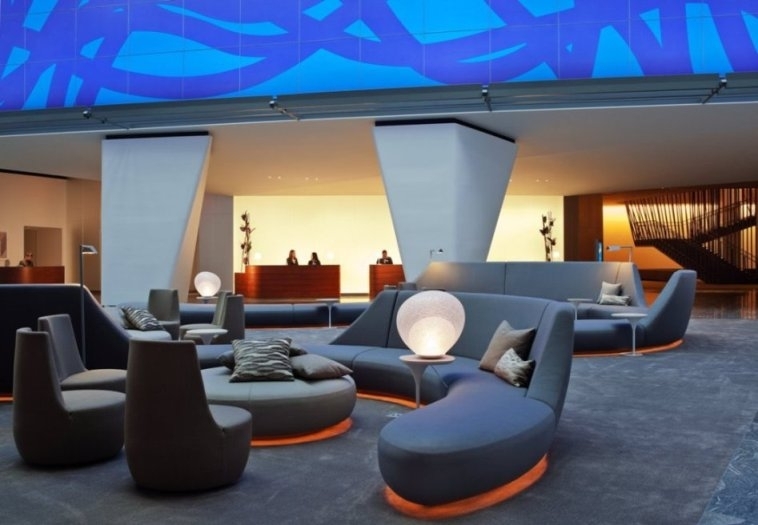 We reviewed (click the links for the article), via free stays arranged by Hilton, the impressive Hilton Tallinn Park, Curio Ibiza, Curio Boston and Hilton Paris Opera recently. Other properties I personally like include Conrad New York (photo below) where I have stayed three times in the last few years on a redemption – it has HUGE rooms as it is ‘all suite’. We also visit the Hilton (was a Waldorf Astoria) Syon Park outside London occasionally with our children – they also went to the impressive Hilton St Georges Park at the National Football Centre in Burton-upon-Trent a couple of years ago. HFP has also looked positively at the Hampton at Gatwick Airport which is directly at the North Terminal as well as Hilton Heathrow Terminal 4, the new Hampton at Stansted Airport and the Hilton Garden Inn at Hatton Cross / Heathrow. Click the link for our review of each of these hotels. Silver – requires 4 stays or 10 nights. Benefits are 20% bonus on base points, free bottled water at most brands. Gold – requires 20 stays or 40 nights or 75,000 base points. Benefits are 80% bonus on base points, guaranteed upgrade of some sort – often to the ‘best’ room in the same category, free continental breakfast (most brands), additional bonuses from 40+ nights per year. Diamond – requires 30 stays or 60 nights or 120,000 base points. Benefits are 100% bonus on base points, guaranteed upgrade of some sort, free continental breakfast (most brands, Waldorf Astoria now included from Jan 2018), free high-speed internet, guaranteed lounge access, additional bonuses from 40+ nights per year. Hilton has been running regular status match promotions over the last couple of years. The current version is here. You get a match for 90 days and will retain the status if you complete four (for Gold) or eight (for Diamond) stays in that time. Reward stays DO count towards earning status. They even count towards the status match promotions mentioned above. All elite members receive ‘fifth night free’ when booking reward nights, effectively a 20% discount on a 5-night stay. Suite upgrades are NOT an elite benefit. British Airways offers free Diamond status to Gold Guest List members of British Airways Executive Club which requires you to earn 5,000 tier points in one year. The full table of elite benefits is here. Hilton was well regarded for providing elite status benefits even if you have booked your room via a site such as Expedia – this is no longer the case. You will not receive anything, neither points nor benefits, if you book via a third party website. There have been recent developments of note at Hilton regarding benefits. Waldorf Astoria hotels now offer free breakfast to Diamond members. You can transfer your points to friends and family without charge. Long-term Diamond members can also now request a one-off rollover of their status without the need to formally requalify which is handy if changing jobs, taking maternity leave etc. From April 2018, elite nights (but not elite stays) will rollover if you achieve more than is required to renew your current tier level but not enough to be promoted. You can also gift status to a friend if you stay more than 6o nights per year. From early April 2018, Hilton is removing the one unique earning offering it had. You will no longer be able to earn hotel points AND airline miles on the same stay. It WILL still be possible to convert lump sums of Hilton Honors points into airline miles. This is not an improvement. No-one wins and some people lose badly. On the positive side, Hilton Honors is always running a major promotion so your average number of points earned per stay will always be higher than the numbers quoted above. See our ‘Hotel Promos‘ page for any current offers. They have been focusing on double points for the last few months although at present they are offering 2,000 bonus points per stay. If you work for the public sector in the UK, Hilton offers an aggressive discount scheme which offers room discounts of up to 30%. Hilton Honors launched a major reorganisation of redemptions in February 2017. There are now NO redemption categories. Previously, redemption rates for hotels ran from 5,000 points in Category 1 to 95,000 points in Category 10. Under the new structure, the number of points required is based on the cash cost of that particular night. The ‘pence per point’ value varies by hotel but is usually within the range of 0.33p to 0.45p. Importantly, you can pay with ANY combination of cash and points. If you have 80% of the points for a free night, you can use those and pay 20% of the cash price on top – or vice versa. The number of points charged per night is capped based on the nightly redemption price under the old Hilton scheme. This means that you will never pay more than 95,000 points for a standard room at the top Conrad or Waldorf Astoria hotels irrespective of the cash rate that night. This means that you still receive ‘extra’ value on redemptions in major cities on peak dates. Elite members receive the 5th night free on standard room redemptions. Hilton has also ‘Premium Room’ redemptions. In general, you should ignore these. They usually involve Hilton effectively buying your room for you from the hotel, at a fixed exchange rate of around 0.2p to 0.3p per Hilton point. This is poor. A typical 4 to 5-star 70,000 point redemption would typically require a Gold member to spend $4,500. This is more than double what Club Carlson would require. However, the regular Hilton Honors promotions will, in reality, drive down this figure. Hilton Auctions is a new initiative which allows you to redeem your points for concert tickets. It is not as well developed as Starwood’ SPG Moments although the odd good event does appear. Last year there was a private concert by OneRepublic at Abbey Road Studios which many HFP readers attended. Points expire after 12 months of no activity on the account – see point 13 here. This is quite tough. You could reset the counter by transferring some Amex Membership Rewards points across or buying 1,000 points. Use a tool like Award Wallet to keep track of expiry dates. I wrote a full article on how to stop your Hilton Honors points expiring. Can you upgrade using points? Under the new structure, you can book any room category you want and use whatever combination of cash and points you prefer. Are ‘cash and points’ redemptions available? You can book any room category you want and use whatever combination of cash and points you prefer. Hilton Honors points can be transferred to a large number of airlines including British Airways and Virgin. The ratio is a pathetic 10:1, however (6.7:1 for Virgin). Can I earn Avios directly without collecting points? No. From April 2018 you can only earn Hilton Honors points. These can be later converted to Avios or another airline if required. Can you get elite status with a UK credit card? American Express Platinum offers you free Hilton Gold for as long as you hold Platinum, whilst the invite-only Amex Centurion card gives Hilton Diamond status. The official Hilton Honors Visa card was withdrawn in March 2018. Is Hilton Honors an Amex Membership Rewards partner? Yes, at a 1:2 transfer rate. Hilton Honors is also a Virgin Atlantic Flying Club partner – you can move Virgin miles to Hilton at the rate of 1 to 1.5, with a 10,000 miles minimum. As Virgin is a Tesco Clubcard partner, you can therefore convert Tesco Clubcard point to Hilton Honors by routing through Virgin Flying Club, although this is not hugely attractive. You can buy Hilton Honors points for $12.50 per 1,000 (less for larger quantities) via this link. Regular sales offer bonuses of up to 100%. It is easy to use up small quantities of points you may acquire as you can use as few as 5,000 points to get a cash discount on your next booking. The new ‘Points Pooling’ feature introduced in 2017 allows you to pass points from one person to another. They do not need to share your address or surname. My second article explaining how Hilton Honors works – click here – gives my personal opinion on the pros and cons. I used to like Hilton but they’ve not for us anymore and now running down points because 1) not delivering The Times to our room three days in a trot. Then after I went down one of the desk jockeys separated our paper into the different sections and said I could only have one section at a time 2) not being upgraded because ‘but you already have a nice room now don’t you?’ when we were entitled to an upgrade, 3) this year’s devaluations without telling me, 4) the US Amex Hilton card and, my personal favorite – the annoying ‘TWANG!’ noise on their website chat box you can’t turn off. Have you tried turning off your speakers? Nope, I have other things going on in the background. Cate – pls name and shame the hotel. Also please email Hilton Honors, that level of service and attitude should be shared with HQ. OT but Hilton related – having a bit of a nightmare getting the Gold upgrade via £10k spend on Hilton Visa, including a three way call with Barclaycard and Hilton at the weekend. Got a stay at Hilton Paris Opera this weekend so would be a shame not to receive Gold benefits (mainly breakfast as this doesn’t seem to be free for all guests anymore). Have they not even acknowledged the £10k spend? Or is it just some long process that’s fallen over? Surprising a 3 way didn’t work. I had no problem a few years ago with getting the gold upgrade automatically after spending £10k on my card. I didn’t have to do anything. Yes, they have acknowledged the spend. The problem seems to be that no-one knows why it hasn’t worked or what to do about it. Had a lot of conflicting information. Worrying. Oh dear. I guess it’s not as simple as just pushing a button then. Bit worrying they can’t just manually fix it if they accept the £10k spend has been made. Hope you get it sorted before the weekend. My gold is now via amex plat as don’t quite hit £10k spend on the HH visa anymore. Turns out an email copying both UK and Global CEOs swiftly resolved things. Funny that! 1) I’ll get points as expected (for the latter two days, but not the first two days), or is it likely they mess it up and give me no points at all? 2) Also, what are the chances I get the gold benefits (free breakfast) for the whole stay. I think it depends on the Hotel. Some abide by the rules of the program, benefits of status only for stays booked direct regardless of additional direct paid stays added on the end, some will turn a blind eye. I think it also depends on how busy it is during your stay. I would send an email directly to the Hotel saying how much I was looking forward to my stays and asking what to expect when you arrive. I would have expected to see “Points Pooling” under Purchasing and Transferring points. It was a great recent addition if you have 2 accounts earning from stays / credit card. I like Hilton and have had good experiences using them in the last year or so, just don’t like their redemption rates now, hard to find much value unless you stay at a 10k Hampton or the Maldives! Just used my points for the first time and have booked the London Hilton Metropole for 40,000 + £50 for a King Exec room. Sounded like a good deal given it’s for this Sunday?? Yes, can’t argue with that. I found the hilton stuky molino venice to be a poor redemption as it was so old. OT: Rob, on your Amex Platinum review you say ‘You will also receive permanent status in various hotel schemes’. I have received welcome to higher tier kind of e-mails (after signing up to platinum) but all state my status expires in 12 months (approx, depending on the scheme). How do you make the status permanent? Thanks. Permanent for the lifetime of your cardmembership. So the card runs until expiry, if you’re still a member you’ll get a renewed. Should one of the hotel chains pull out then you’ll drop when the card expires (this happened with Accor). The reason permanent is mentioned was originally Hilton Gold was only available for a year. Where else can I turn 2 nights stay at a £70 per night Days Inn into a $300 resort hotel in napa. While it can be tricky to earn Wyndham Rewards, just make sure you top up your allowance each year. Even 3000 points Part pay can be a good deal. Part Pay is about to be changed, so the cash element is driven off the hotel room rate. Not as good as it was. It’s ironic that BA and Hilton have a tie up given that if you book a Hilton as part of a BA holidays package you get no status benefits at all. My gold status with Hilton is due to expire in a few days and I will revert to Silver. Does anyone know if I book stays this week (whilst still Gold) for next month onwards will I still receive the Gold Benefits including free breakfast and higher earnings rate? Am sure in the past I’ve read this is the case as status is based on the day of booking??? Would appreciate clarification! Thanks in advance…. Yes – it’s when you stay not when you book. I’ll drop to Gold but already locked in my “Diamond” upgrade for a stay in May. Thanks Genghis – I will get booking over weekend then as I’ve also got the Amex offer with Hilton to utilise! I will probably upgrade my PRGC to Platinum later in year to regain Gold status and gain more Avios in the process! Dave – give Honors a call, politely explain you are considering booking more stays and state that if they reinstate Gold you will definitely book them with Hilton. It’s worked for me in the past. Helps if they see you’ve had recent stays.